Alexandra Louise Champion Hackett is hard to miss in a crowd, she’s the girl in the club wearing a twin-set fashioned out of repurposed Ikea carry bags. Or a pair of pants made of white latex. Or a bucket hat made of AstroTurf. The enterprising designer has fostered a cult following thanks to her practice of repurposing non-conventional fabrications into wearable garments. An adept student of both branding and visual identity, Alex is a talent that you’ll no doubt be seeing a lot more of in the future. Today we’re excited to unveil a small preview of some exclusive editorial that we’ve been working on in collaboration with her – keep your eyes peeled for the full shoot in the next issue of ACCLAIM. Just handed in my thesis proposal (entitled McNike) and I’m currently working on my grad collection. Got lots happening though. I mean – I got asked the other day what I do in my free time when I’m not sewing or what I do to enjoy myself, and I said ‘sewing’. Hard to believe yeah? I’m in my honours year studying a Bachelor of Fashion Design at RMIT – about 6 months off finishing, not that I’m counting down or anything. I’m a workaholic, I’m obsessed with Nike (and McDonalds (and any major brand)), and I have an alias: Sheniqua. Why does menswear resonate with you over women’s clothing? I think there’s a lot more rules to break with menswear. Maybe it’s just because I’m female, and it’s too easy to design clothes for my own body, so I relish the challenge. Anyone who knows me would know that I never make anything easy for myself. Maybe that’s why I’m fascinated by unconventional textiles – because no one else has done it before so there’s no instruction manual. Tell me about your infatuation with sportswear. Man, I just love it. I love the obsession. I love owning sneakers that no one else has. I can make my own clothes, so footwear is basically the only thing I spend money on. Oh wait, do you mean my infatuation with making sportswear? Same answer – I love it – it’s high tech and based almost purely on functionality so it’s easy to appropriate. Do you think it’s the most fitting style of garment for our generation? Yeah, totally. I mean it’s high tech, it’s branded and its desirable – and yet we have such a sedentary internet-based lifestyle. The irony is great. What’s our current generation’s uniform? All black everything. Maybe some white or grey. Grayscale nonetheless. 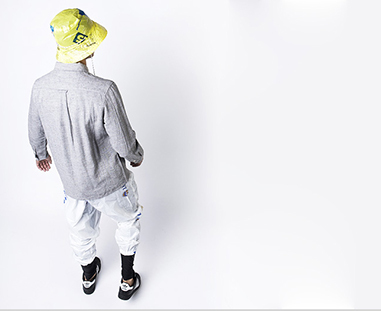 The hybrid-lad: sneaker, branded socks, up-market track pants, oversized tees/sweatshirts, a windbreaker, and a cap. Throw in some 3M reflective fabric. Or did I just describe the uniform of my ideal man? You’re obviously interested in repurposing non-traditional fabrications. What drew you to that? I think because there are so many boundaries constricting fashion and what we wear so it’s refreshing to appropriate things not conventionally associated with clothing. Fashion can be so serious. Sometimes we need a break. What’s the appeal of the super brand, like Ikea or McDonalds? I think it’s the fact that logos and branding can be applied to any product. Companies sell an idea rather than a good or service. They sell a lifestyle and you represent that lifestyle when you buy the product. I mean, Hood By Air sells fruit bowls. How do you channel that identity into a wearable garment? Basically it’s all about appropriation and merging industries. Technically, anything can be a textile, the only thing stopping us from wearing it as clothing, is social norms, and also practicality probably. I mean it’s not that comfortable to wear a shirt made from astroturf. Does using non-traditional materials transcend people’s understanding of clothing design as a practical exercise? Yeah of course, it’s probably the most obvious method of questioning how we view clothing. Everything I make can be worn on the body if it’s still, but once you start to move or do any activity whilst wearing it, the impracticality of the textiles become apparent. There’s a binary relationship between the mass produced materials you source, and the way that you translate them to one off pieces. Do you enjoy working in that area? Definitely. I like the idea of reinventing something that initially seemed mundane. It’s ironic and it downplays the whole fashion thing. It is risky though, when you use a fabrication that’s easily accessible, it means that almost anyone can reproduce it. Do you think we live in a disposable culture? Idk. Yes and no. I empty my trash bin on my computer every time I drop a file in it, so I guess that’s saying something. Do you want to engage with that? I guess so. I make clothes out of things that would normally have been thrown out, or have been thrown out already. I’m constantly fossicking through bins or picking up trash from the side of the road to make things out of. So much! I’m really excited (but also exhausted). I can’t tell you about a lot of it though, you’ll just have to wait and see.